Fun, right?! I'm not sure what I was in the middle of saying in the photo, but certainly something that couldn't wait one second more. At least my eyes are open. Oh, that photo wasn't about me? Okay. Shop here. ps these make the perfect teacher's gifts, and you can have them personalized with names, dates, or quotes! pps have you entered the $100 giftcard giveaway here? This is a really great idea. When I used to live in a little hip, thriving downtown, I always made sure to avoid the big boxes and do all my Christmas shopping downtown. Now that I live in the middle of no where, maybe I'll do all my Christmas shopping on etsy! Ever since I saw their stars here, I have been funneling all my birthday money into their shop. 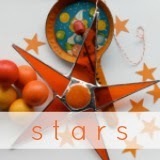 I have 5 of their beautiful stars hanging in my kitchen and they make me smile every time I see them!! You have the most beautiful family! Love the new stars! I bought a couple for my impossible-to-shop-for MIL last year and they were a huge hit. And I'm happy to say that a Piggy-and-Dirt star tops our tree since last year!